At the bottom of this post, you’ll see links to the other delicious recipes and accompanying stories relating to the ancient Irani festival of Mehragan. It has been a lovely way to connect with people of similar interests and make friends. I’ve met two of the ladies from this group, in Iran: Azita from Fig & Quince and Fariba from ZoZo Baking. 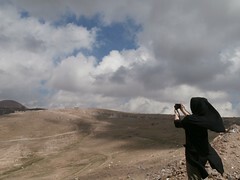 As it happened we were in Tehran at the same time this spring. 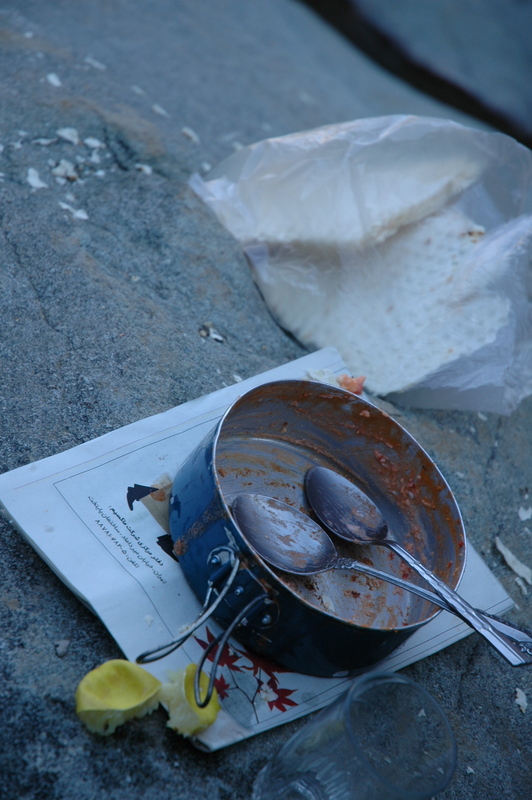 It’d be great to think that one day we can all get together each with a pot of food and stories to share. It would seem the origins of Mehragan are a bit of a mystery to most Iranies. Some argue it is an observance of the equinox; others, the honouring of the deity Mitra. When I asked elderly relations and friends about it, they didn’t recall particular traditions around this event. It may be that this festival was forgotten in Iran post-Islam from the Sassanid period circa 7th Century. Having said this, a small number of zoroastrians continued to celebrate it. A history professor friend of the family mentioned that Mehragan was reintroduced to common parlance as a consequence of the extravagant spectacle the last Shah put on in the 1970s at Takhteh Jamshid/ Persepolis. Either way, it has changed through time with the changes to the Irani calendar, language and religion. It doesn’t seem to coincide with the autumn equinox, which is around the 20th of September, or the first day of the 7th month, Mehr – the first day of school – in the Irani calendar. The word mehr means loving kindness. Mehri is a girl’s name, whilst Mehrabon, meaning to be kind, is also, a boy’s name. Continuing on the etymological theme, it’d be quite nice to think it was a sort of valentine. Love is in the air, after all ……well, it certainly is for spiders. You may notice there are lots of beautiful webs shimmering in the low sunlight of autumn, or more of them in your bath. This is the time of year they are out looking for a mate! Staying with critters, it is also the time I change around my wardrobe and find holes in my clothes – pesky moths make me very cross. I’ll come back to the topic in hand now. 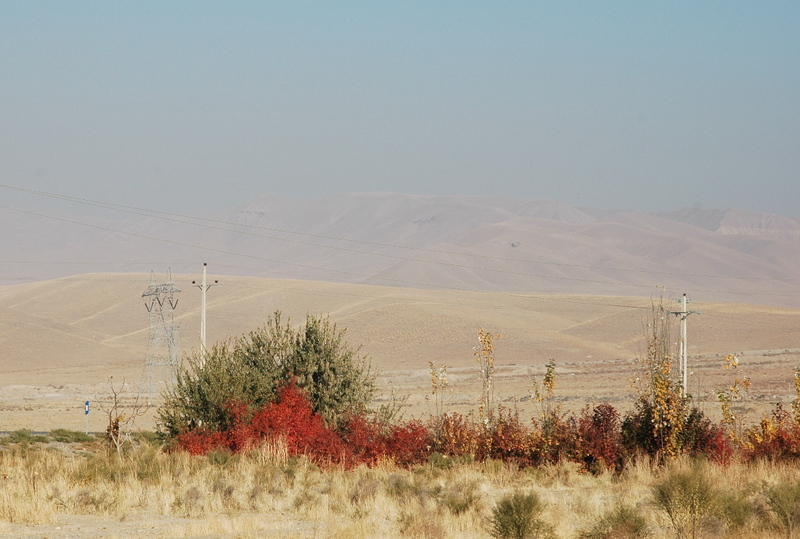 Autumn in Iran comes all of sudden. There is a phrase in farsi, etedal hava, which roughly translated, is equilibrium of weather – that is, not too cold and not too hot. 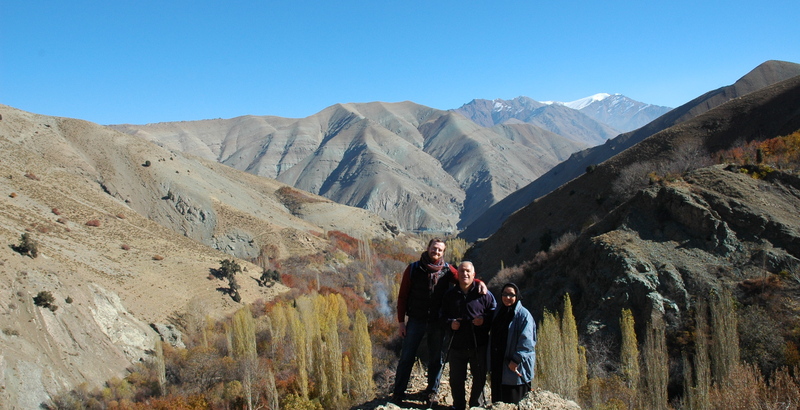 With Iran, being a mostly mountainous and arid country, human habitations are on river banks, usually in the valleys. 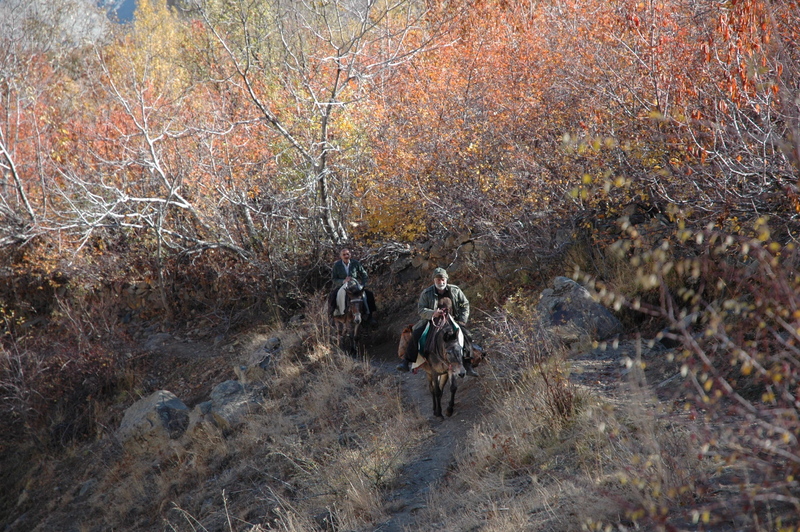 These valleys turn from the verdant green of summer into a blaze of autumn glory. 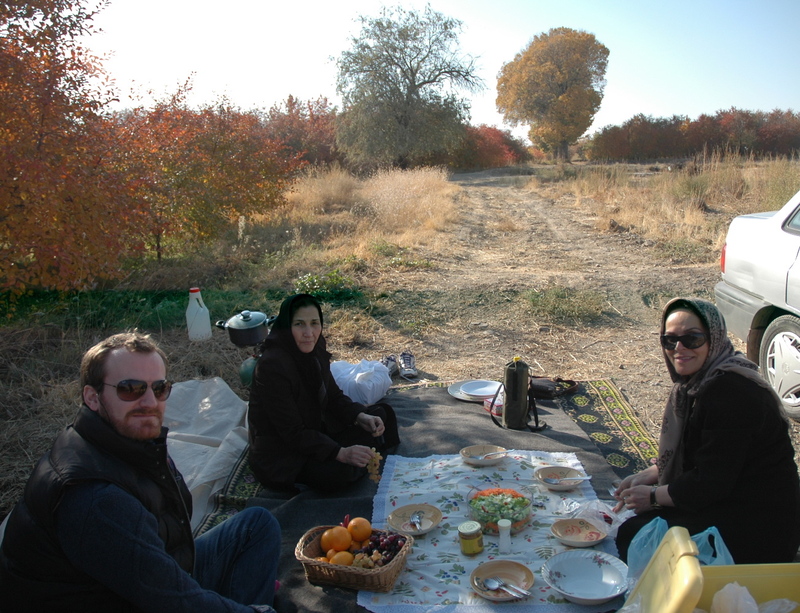 In years past, when I’ve visited Iran, I’ve been fortunate enough to to be taken on picnics during this time. 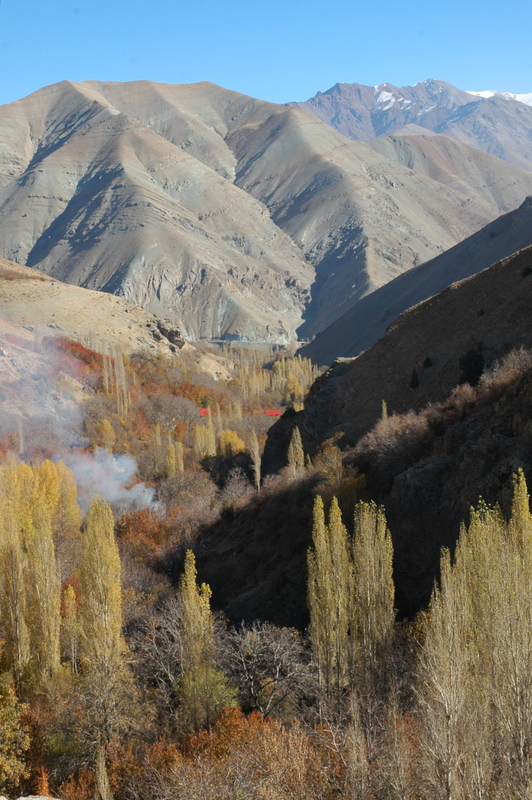 Below are photos of Igol, north of Tehran, and Daryan Valley, northwest of Tabriz. 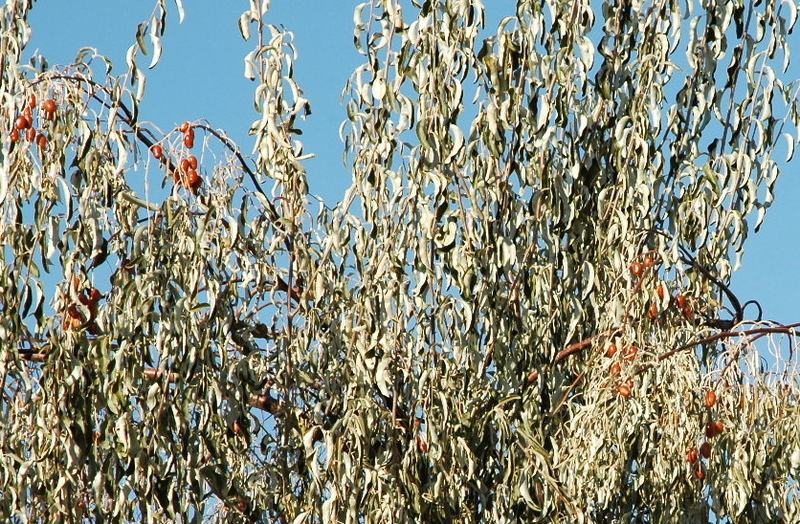 We found an eeda senjed oleaster tree in Daryan, the fruit of which we put on our haft sin to signify love. Humans have observed and honoured these natural phenomena since the dawn of our history. They are celebrated in different ways around the earth and in this season most celebrations centre around harvest: giving thanks for what has come, hoping for a future of good harvests, and storing up gluts for the winter. Though we didn’t mark Mehragan specifically, in our home, this was a time of harvesting and preserving. We’d go to the bogh in Osku and collect fruit, herbs and vegetables from the orchards and vineyards. The grown ups would be busy sorting, drying, pickling, brining and lavashak (fruit leather) making. The house would smell of herbs, vinegar and boiling sweet jams. Lots of glass, clay and plastic vessels would be filled with treats. 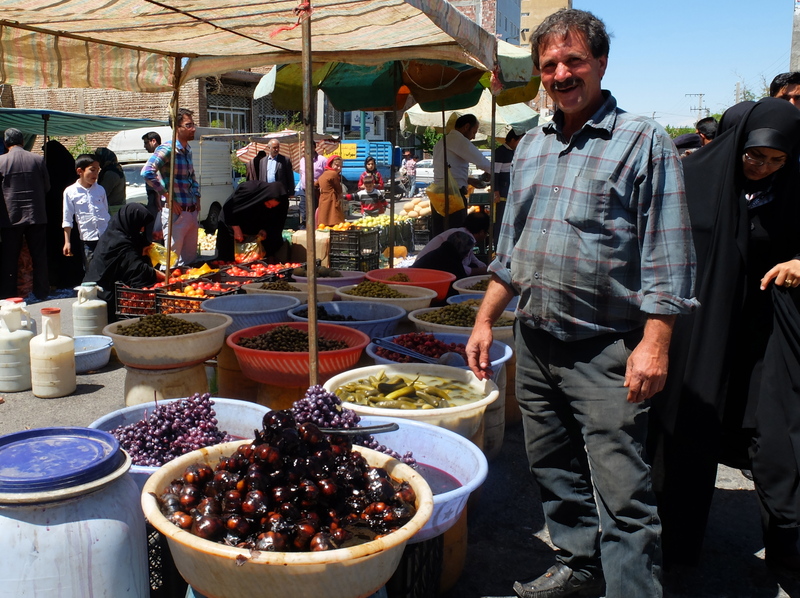 Some were for special occasions such as pickled grapes to be eaten on Shab-e-Yalda, the longest night, apricot jam with the kernel inside for guests, and pickled stuffed aubergines to eat with koofteh. Then there were the everyday jams like grated apple or my favourite pickle, liteh, which I share with you below. I suppose the greeting for this festival would be Mehragan bayramuz mobarakdi, in Azeri? I’ll finish as I started, in Bath. 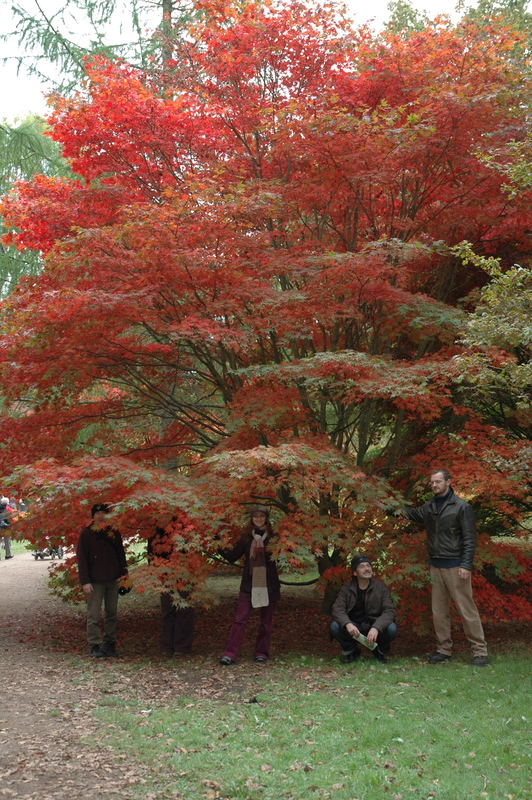 We are lucky in having Westonbirt Arboretum a few miles away. Having lived in Ontario for a couple of years, I concede fall colours are more spectacular there; however, I watch the virginia creepers on the buildings in the city here and as they turn red I know my annual trip to Westonbirt is due. 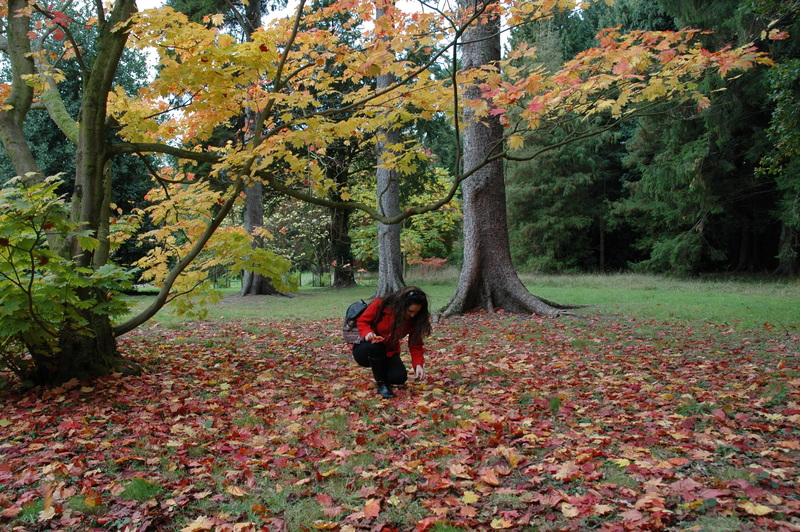 Below are a few photos of previous years frolicking amongst the trees. Flowers give way to leaves, as Rumi says. Such beautiful decay, going out in a blaze of glory. Click on the link and sink into the music (autumn leaves). 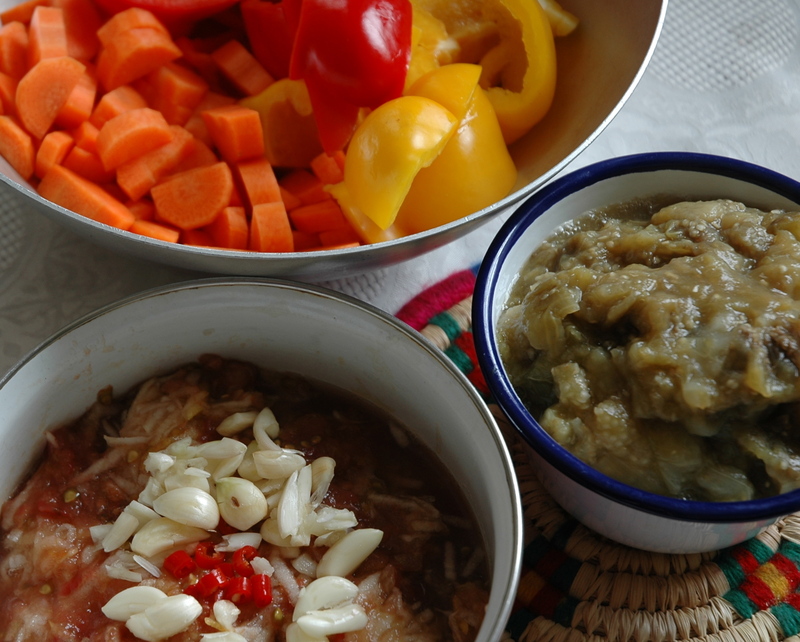 This recipe makes 1500ml of pickle which is about 7 – 8, 8 oz or 220g jars. Get everything you need to make this together: that is, the ingredients washed and drying, the seasoning, jars, lids, food processor, grater, knife, chopping board etc. If you have your own technque of sterilising jars then do as you do, but if you don’t, this is what I do for my pickles made with vinegar. Make sure your jars are clean, then put them in the oven for 15 – 20 minutes on 180 c. Boil the lids and then take them out carefully and leave them to dry without touching the inside. They need to be cool when you fill them. I started by covering the chopped pealed aubergine in a non reactive pot and bringing it to simmer and letting it cook down for 20 minutes. I used all organic vegetables as I find they give off less water. Whilst the aubergine was on, I prepared the other vegetables. Using a food processor, I vuzhed (technical term, meaning processed) the carrots, pepper and garlic as they were the hardest. Then I added the grated apple, tomato, and now cooked and slightly cooled aubergine. The aubergine didn’t have much liquid once it had cooked. Having vuzhed all of them together I added sea salt, a good grinding of black pepper and the chilli. I also added another 50 ml of vinegar and tasted it. It shouldn’t be too wet but not too dry either. It’s meant to be tangy but flavoursome with the garlic so it needs more seasoning. Add some now. I poured the mix into a large jug and decanted into the jars leaving 5mm margin. Make sure there are no air bubbles in the jar; you could use a sterilised knife to burst them. Then I top with vinegar and wipe rims clean of any pickle before I put the lids on and bask in my handiwork. The beauty of this pickle is you can eat it straight away. It keeps for at least 6 months in a cool dark place and once opened, I keep it in the fridge. I hope you enjoy it and it becomes a family favourite for you too. Wow, such a beautiful story and mouthwatering torshi! Thanks and Happy Mehregan to you too! Simi jan, this is a fantastic post in every way. 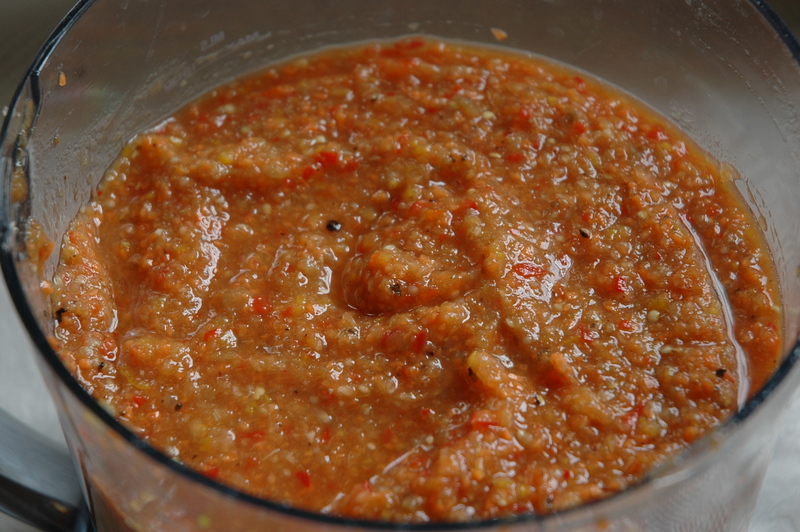 I’m so happy there’s a pickle recipe for the #Mehregan2014 roundup. 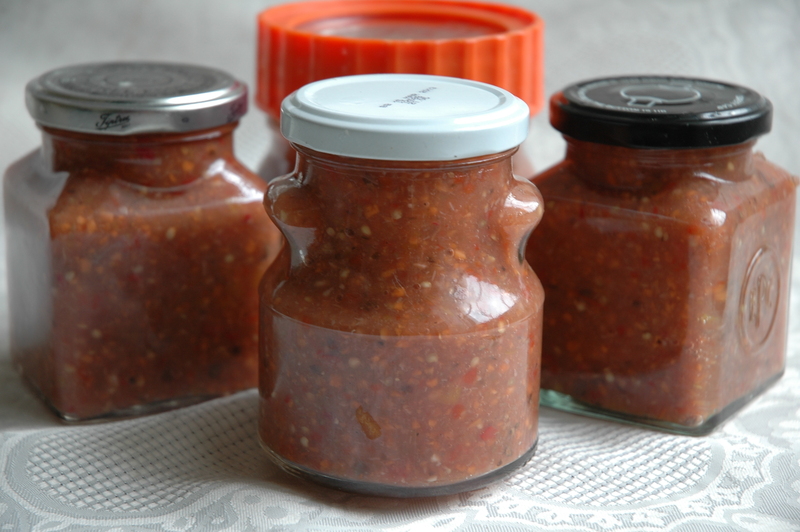 I have a ton of jars leftover from canning tomatoes this summer and I was thinking what to do with them…Love torshi liteh, so I’ll have to try this. One question: is it okay to not do a water bath after the jars are filled? Merci Sara jan, glad you enjoyed it. I’ve never water bathed anything. Reading US recipes I notice they water bath almost all preserves. If that would make you feel more comfortable then I don’t see why you can’t. I’d say, so long as you use good vinegar and perfect seasonal vegetables ideally organic (as some vegetables give off a lot of water which dilutes the acidity) it should be fine. Why not make a small batch first to see how you like the flavours? It is a straight forward recipe so doesn’t take too long to knock up a small batch of it. Let me know how you get on. My pleasure Fariba jan. Looking forward to trying masghati. 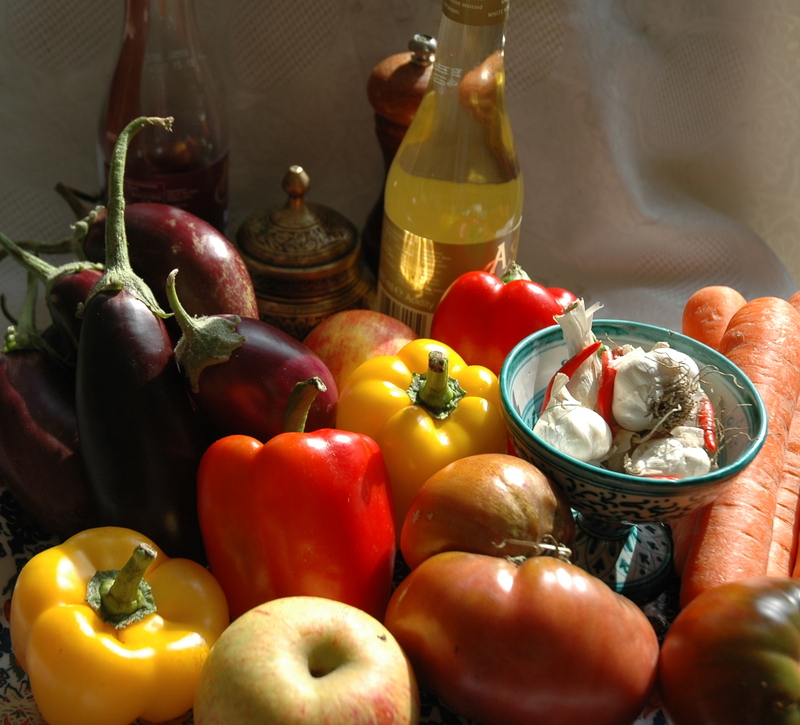 Thank you for sharing this beautiful recipe, and your Mehregan traditions. I like that you can eat this pickle right away! Oh this is such a lovely post! I love reading about everyone’s traditions and memories. And your torshi – YUMMY! Simi joon, this is such a beautiful post you’ve put together. I really enjoyed it! And you really did choose the perfect food for this season as it’s time to harvest the fruits and veg of the summer and pickle them up! And I LOVE this torshi. Sending a warm greeting from one Azeri to another, xoxo! Merci, you are too kind. It’s been a lovely way to make new friends, as I say in the post it’d be lovely to all meet up one day. Absolutely treasured reading this rich, eclectic and interesting post. LOl re spiders and love! 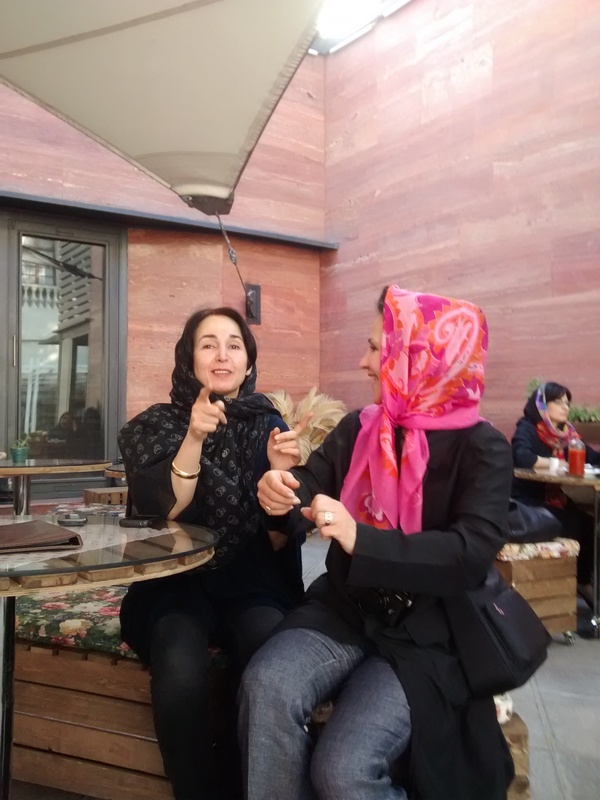 I’m so glad we got to meet in person, and in Tehran, Iran, of all that! Just imagine! Happy Mehregan and I’ll be bookmarking this graet recipe. Merci Azita jan. I’m a bit of an arachnophobe so I need to know their movements. Looking forward to our next roundup, love from Bath. 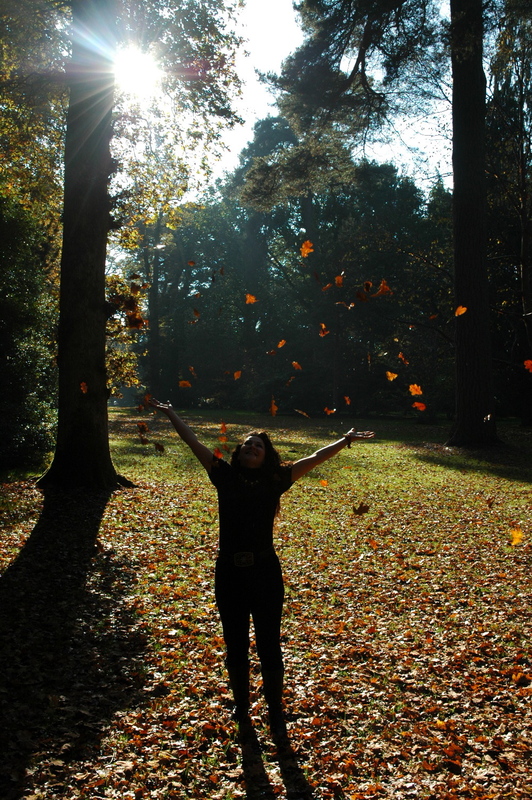 Love your pics, esp the last one of you tossing leaves into the air! And liteh, what can I say? I could eat my weight in it, especially this stuff of yours. Looks so yummy! What a beautiful post. Merci Coco jan, I love all torshi and this one takes me from summer into winter. Glad you liked the photo, it was a lovely day. Yum yum yum! This looks amazing and I love your storyline Simi joon. So glad to have ‘met’ you and learn your recipes and also your Azeri background. Much love, ahu. Merci azizam, glad you like torshi. My fellow Turk!! You recipe sounds delicious! Thank you so much for your love and support as well as joining us on this delicious journey! Saghol Sanam jan for brining us all together. It’s been great to read all the recipes and stories. I feel less alone. Love from Bath. Dear Simi, my mothers side of the family is Azeri from Tabriz. I have very fond memories of spending summers at my grandfathers house, as a very young child. I love reading your story and all your beautiful pictures. And torshi liteh is a favorite in our house. Even my little ones love it! Can’t wait to try yours! Merci chokh mamnoon for your kind words. 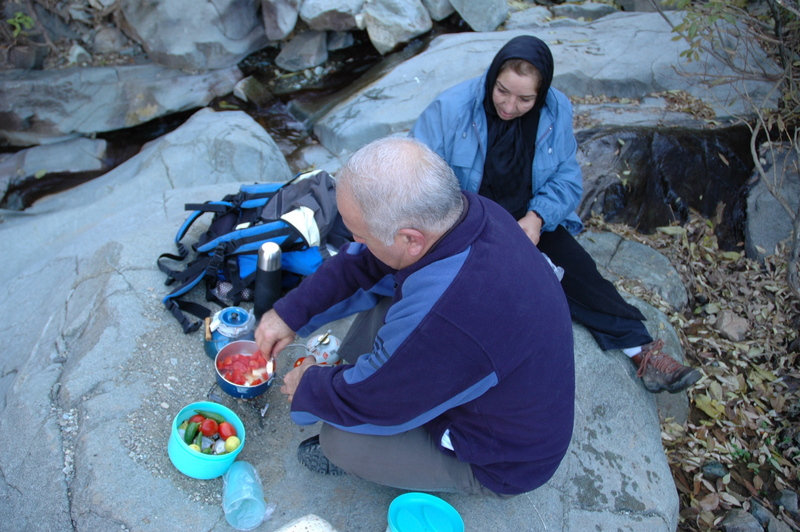 Reading your posr brought back nostalgic memories of the picnics we went to north of Tehran. You have made me miss Iran and my favorite Persian foods! Simin jan, What a touching post. 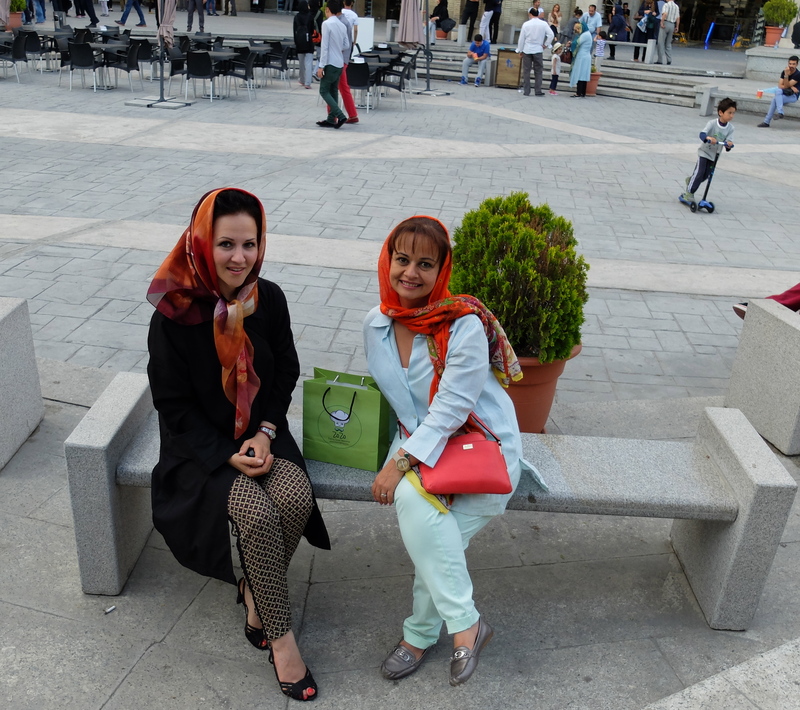 I envy you that you met with two of my favorite people, Azita & Fariba. I am Turk from my Father side and how you wrote ‘leeta turshisi’ sounds like how my Father would have said. Thanks for the recipe. Belated Happy Mehregan! 🙂 Fae. Fae jan. this forum has been a lovely way to make new friends and shared experiences. Thank you for your kind words.